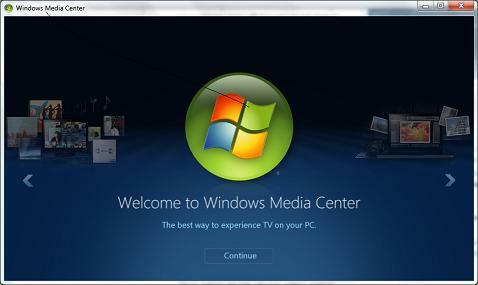 How to set up Windows Media Center on Windows 7? On a new Windows 7 system, you need to follow these steps to set up Windows Media Center before you can use it. 2. On the welcome page, select Continue, and then select Express or Custom. Custom Setup checks components like networking and Internet connection for you, then gives you the opportunity to set up the features and advanced settings that fit your needs. If you choose Express Setup the first time: you can return to Custom Setup later. 3. After selecting Custom, select Next to reach a page titled Get the Most from Windows Media Center. 4. Select Yes to enable Windows Media Center to periodically download content to improve your experience like music and movie information, and TV listings so you can schedule recordings. 5. Click "Next" until the installation is done.